Hey everyone, it’s Tamara. I’m a certified personal trainer, national bikini competitor, and a mom of two crazy boys. Normal for me includes rushing around from work, picking up my boys from school, running errands, hitting the gym, and everything in between. Much like you, there is no such thing as “free time” during the day. While hustling from place to place it becomes easier to pick up a bag of chips, candy bar, or crackers to munch on and settle my roaring stomach. This is the worst thing to do if you are trying to get lean and lose weight. You don’t want to give your body the extra calories, sugars, and fats that are in most of snacks. Instead, you need to start reaching for the nutritious IdealLean FitChix Protein Snacks! It is the perfect on-the-go savory snack that tastes DELICIOUS and gives you 15 grams of Chicken Protein with a low carb crunch. Not to mention that ingesting protein stimulates the release of your body's hormones that increase satiety and decrease hunger. All you have to do is just grab, snack, and go! 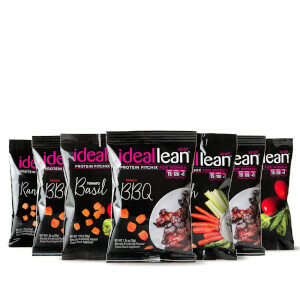 Why should I use IdealLean FitChix Protein Snacks? Snack attacks. The fitness killing, goal destroying, and fat gaining plague that has haunted gym goers and yoga enthusiasts for ages. Snacking on high calorie sugary treats throughout the day can hamper your weight loss results and prolong your goals. Can I view IdealLean Protein FixChix Snacks' nutrition facts? What are the main benefits of IdealLean FitChix? Made with Chicken Protein Isolate, every crunch of IdealLean FitChix gives you a quick, on-the-go, high protein, and low carb savory snack. Enjoy all of our savory flavors while crushing cravings. Great on salads, soups, or for road trips! Where do IdealLean FitChix fit in my meal plan? Any time you need a high-protein snack to satisfy your munchies! What are the macros for 1 bag? How much is in one bag? One bundle? What meal should I use this for? IdealLean Fitchix are great to replace any snack. Also try them on top of your salads and soups for a high protein crunch! What is chicken protein isolate? Chicken protein isolate comes directly from chickens. It is a highly digestible protein and is filled with natural nutrition. It is free from dairy, soy, fat, and sugar.